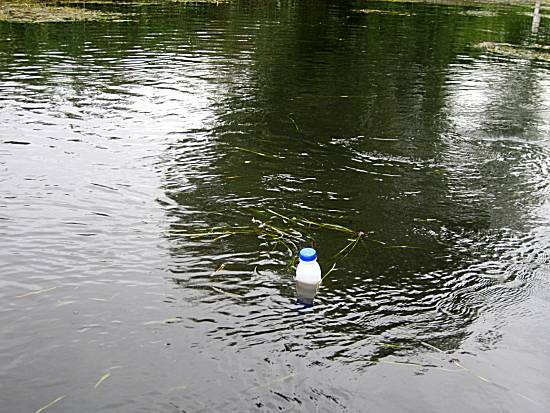 The Intrepid and brave trio, Alan and Ron with Neil in his milk bottle, again plan to test their skills against some of Britain's feared inland waterways. This time, they felt that the infamous River Nene travelling eastwards across Britain from Northampton to the Wash requires conquering. 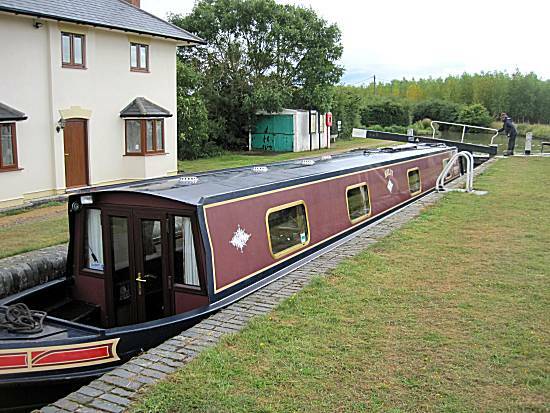 The Black Prince boatyard in Napton (south of Rugby) are making available a 58ft narrowboat for the expedition, especially fitted out with the necessary safety equipment for such a dangerous mission. Knowing the incredible distances that the crew will have to travel, the boatyard has arranged for the narrowboat to be available extra early, for a 12:30 departure. 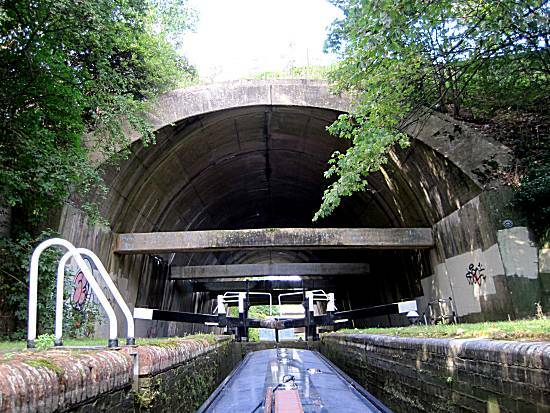 The crew know that they will be required to reach Braunston that afternoon, negotiate the 6 double locks and the traverse the entire length of Braunston Tunnel (2,042 yds), before nightfall !!!! After months of painstaking planning, the fateful day for the start of their latest mission had arrived. 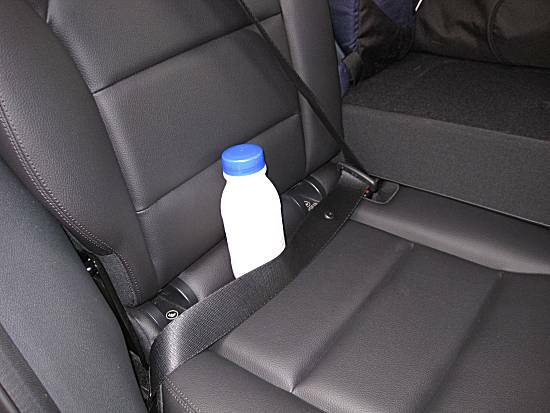 Cunningly Alan had hidden two Tesco Discount vouchers worth a total of £8 off their provisions and Ron was quick to programme the co-ordinates of the Tesco Store in Rugby into his Sat Nav system, so that they can take full advantage of the savings. The store was rapidly located and the crew procured, sufficient porridge, a "fluted" pork pie (Medium size), together with smoked mackerel fillets, low calorie sugar, salad and fruit. The crew were satisfied with their purchases. 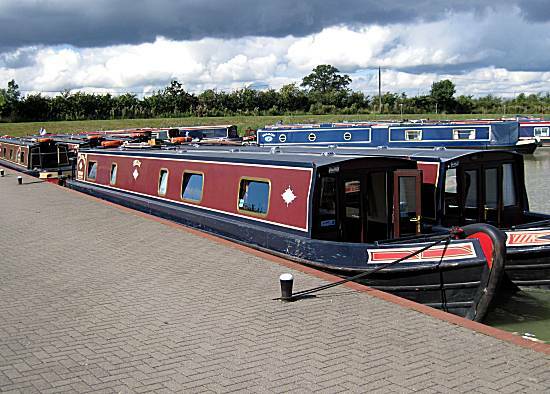 The staff at the boatyard were expecting the crew and quickly showed them to the "Narrowboat Kelly" which had been especially prepared for the dangerous mission. Neil approved the provisions purchases as they were loaded into the galley and then was seen carefully checking the safety equipment on board to ensure the safety of their mission. The boatyard staff waived the normal safety tuition and instead listened and watched in amazement, as the crew quickly took command of the craft. 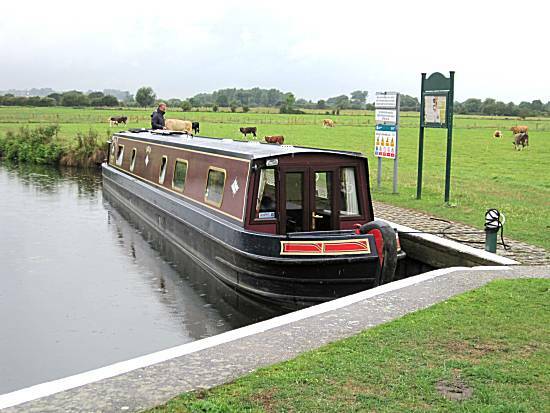 Ron carefully guided the narrowboat from its moorings, proficiently turning the boat onto the Grand Union Canal heading towards Braunston. 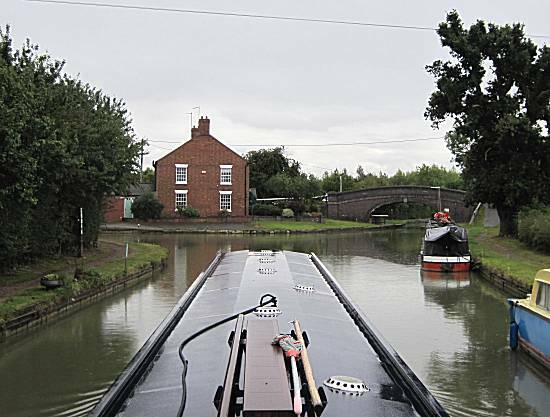 Quickly the dangerous and confusing junction with the Coventry Canal came into view, but Ron instinctively navigated the craft safely towards the Braunston locks, knowing that afterward they would have to traverse the Braunston Tunnel (2042 yds). The crew were again grateful that the locals had cleared a passage on this feared section of canal. 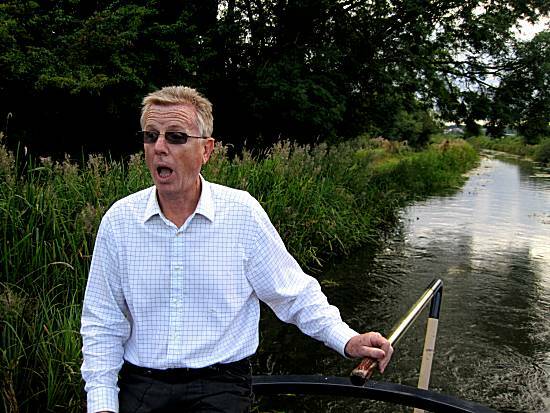 Much confusion was witnessed as the craft were seen trying to turn and get out of the way of the now famous Narrowboat Kelly, but the crew were unperturbed. 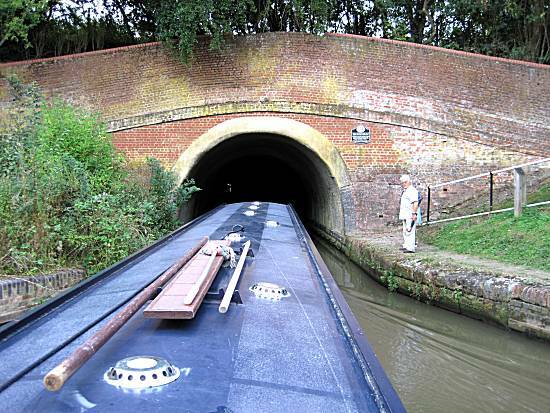 The locals were horrified to see the narrowboat head straight into Braunston Tunnel without the normal statutory rest period. However, the crew had prepared themselves with special savoury treats, courtesy of Alan's wife. When the crew met another narrowboat travelling towards them with inexperienced crew. However, they were prepared when the crew on the other boat panicked and removed all forward power from the boat leaving it drifting dangerous into their path. Using their incredible skills they carefully nudged the boat back into the correct position and saved the mission. Despite this inconvenience the transition of the tunnel was accomplished in a mere 19mins and 8secs, but the crew were unimpressed knowing that many other records would be broken during this mission. The narrowboat pulled into especially prepared moorings at Buckley Wharf, well ahead of schedule, before 5pm. The crew prepared themselves for a night of festivities at "The New Inn", located by a lock and the A5 road bridge. The crew enjoyed meals of Steak and Kidney Pie and Chicken Curry accompanied by Hobgoblin Ale to a particularly high standard, in a rather empty pub, before returning to the boat for small portions of cheese and biscuits. They carefully reviewed the successes of their day before retiring to their bunks, only too aware that the following day required 10 hours of cruising and a total of 24 giant locks to be negotiated. The confident crew quickly fell into a warm and relaxing sleep knowing that success remained within their grasp. The crew awoke at an early hour anxious to start another long and difficult day. Neil still refused to impart the crucial porridge recipe, but Ron made a creditable attempt at emulating it, before setting off at 8am to tackle the first of the 24 locks of the day. 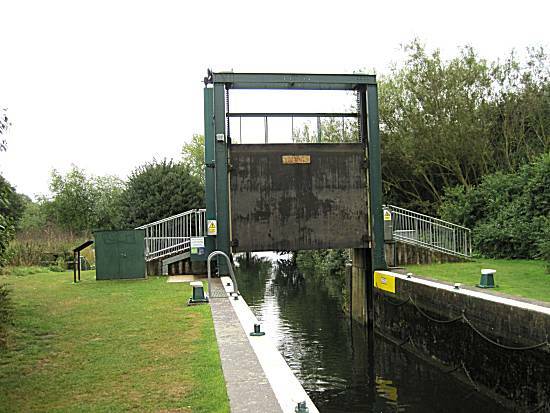 Seven giant double locks came quickly on the Grand Union Canal, which were tackled swiftly and efficiently by the competent crew, but there were aware that 17 locks lay ahead of them on the little used Northampton arm. 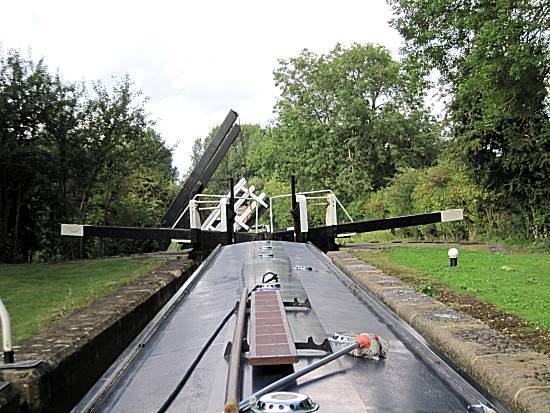 After the trauma of the double locks subsided, cruising became idyllic with long sections of canal with no locks, where the crew were able to navigate at incredible speed. However, their progress was soon impeded by two craft ahead going only at normal pace. Quickly they made a decision to take an early lunch and moored to prepare, Pork Pie salad with Granary bread, tomatoes, beetroot, coleslaw with branston pickle. As it was a special day, in addition, they allowed themselves two pickled onions each. On restarting their mission, they were horrified to find rain falling, which increased in intensity and lasted a for more than one hour. However, this took their minds off the fact that they would soon have to make the perilous left turn at Gayton Junction onto the Northampton Arm!!! Alan steadied the engine power and trimmed the rudder, whilst Ron hid inside in the toilet, as they approached Gayton Junction. However, despite a number of badly moored boats in the area the manoeuvre was accomplished with great accuracy. 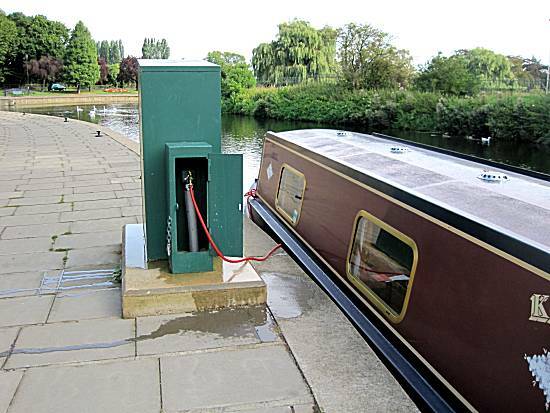 The first lock on the Northampton arm lulled the crew into a false sense of security as it operated like any other lock, but they soon found out the reality of the other locks on their torturous journey. The crew could not believe their eyes, when a giant cavern confronted them. 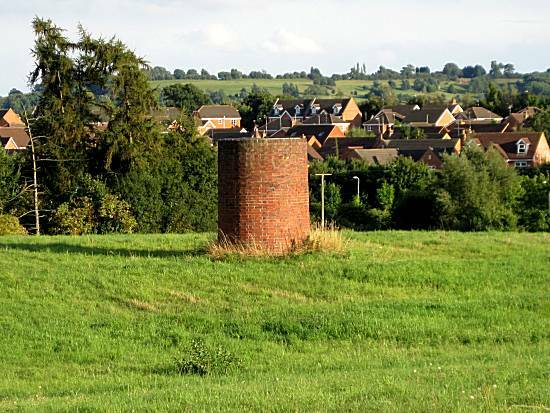 However, they were not concerned knowing that they cavern merely held up the M1 motorway above them. 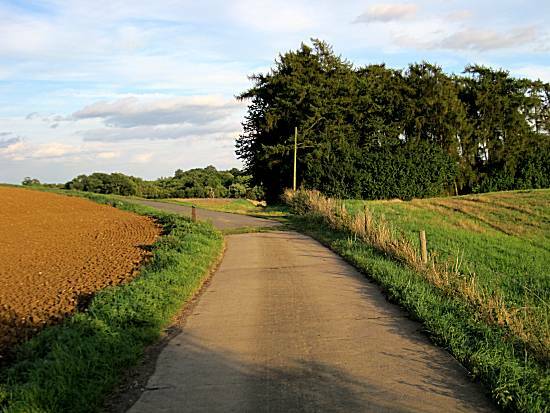 The canal route became narrower and narrower and was soon nearly impassable, but the crew continued. 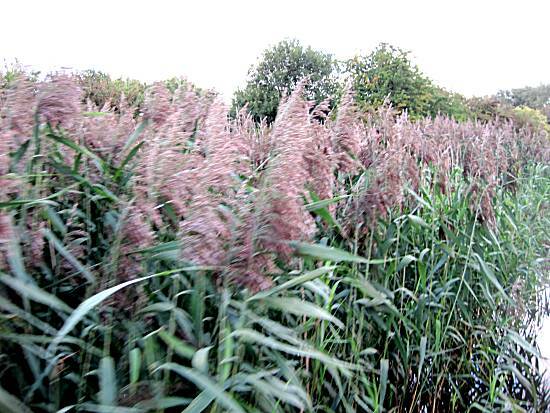 Within minutes the passage of the narrowboat was blocked by reeds, which the locals said blocked this section of canal for years. The crew stopped for coffee with 2 Hobnobs, whilst they formulated their plans. Afterwards using special reed clearing techniques, they cut back the reeds and re-opened the canal, much to the eternal gratitude of the locals. The crew declined the gifts bestowed on them and continued only slightly behind plan. Ron was horrified to discover a tree trunk blocking their entrance into lock number 16. However, using their immense strength they dragged the obstacle out of the water and again re-opened the canal. After a long and hard day the exhausted crew found just one last lock laying between them and the fast running dangerous River Nene. Quickly they opened the gates, entered the river and moored in a special place prepared by the locals for their arrival. Much rejoicing was witnessed, but the crew were acutely aware they were the only craft on the river!!! The crew were quick to shower ready to explore Northampton in the hopes of finding a Chinese Restaurant. With the help of directions from a local, they were directed to the Wok Inn, where they feasted on Crispy Duck with special chinese beer. Afterwards they set off back to the boat, via the first lock on the river, anxious to learn the secrets of the giant locking mechanisms. After coffee, without cheese or biscuits, they discussed the intricate complex locking equipment and retired to their bulks knowing that the morning locking procedures would no longer prove difficult. However, they knew that these complex procedures would have to be repeated 15 times before they reached their planned destination for Monday night at Irthingborough. Sleep did not come easy for the troubled crew. The crew awoke during the night to hear rain beating on the roof of the vessel. 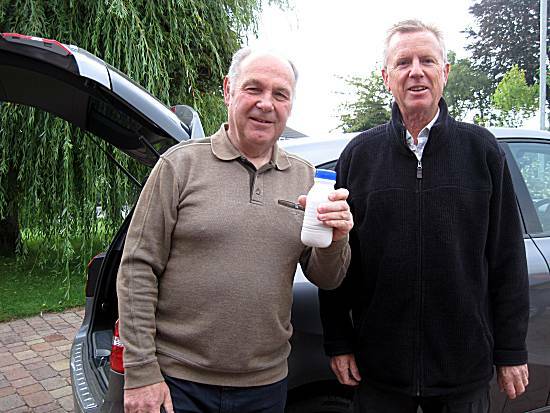 Rain proofing porridge was therefore prepared by Ron and consumed with alacrity, before the crew readied themselves for departure and the first lock on the River Nene in the continuing rain. With great skill the lock was passed, with the help of the special key provided by the lady at Gayton Marina. The crew found the complex maze of narrow lock and weir cuts confusing, but soon realised that a series of special signs had been provided by the locals to help them. The were grateful for their assistance. As they proceeded in the rain, they soon realised that most of the locks were of a complex guillotine type design. Although operation of this machinery presented no problems to the crew, it did slow their progress. 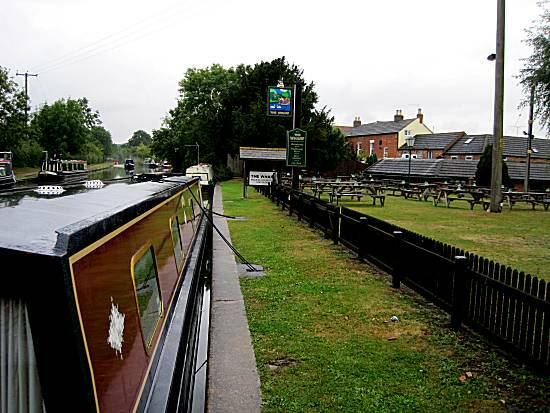 During one particularly heavy shower of rain, the crew cunningly moored in the lock cut of White Mills Lock, where they set about preparing the remainder of the Pork Pie rations, with salad, rain preventing cup-a-soups, and pickled onions (except Ron). This was followed by lashings of healthy fresh fruit salad. The crew felt invigorated and set about continuing their journey in the rain with added enthusiasm. The journey continued, although the crew were becoming increasingly concerned that fresh water supplies were dwindling!! 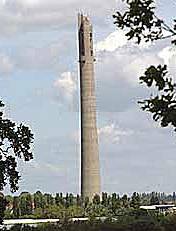 Due to the unbelievable performance of the crew, they decided to proceed to Wellingborough for the night and moored opposite the giant Whitworth flour mills in the centre of the town at an early hour. Quickly they set off to locate possible water filling locations, but were attracted towards the town, passing a 24 hr Tesco super store. 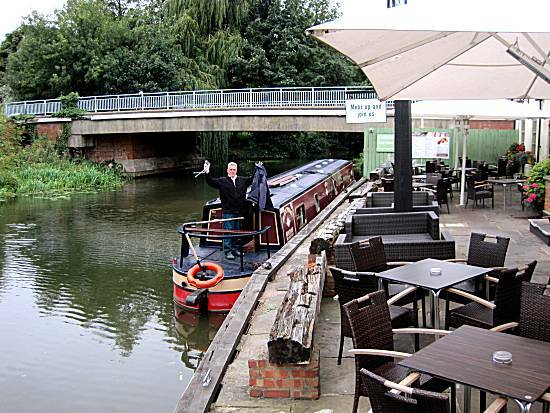 On arrival at Wellingborough, Neil checked out the mooring arrangements and added his seal of approval, although he was concerned that the noise levels might keep the crew awake. Afterward the crew set off to locate the water filling arrangements, which were quickly located and met with the crew's approval. 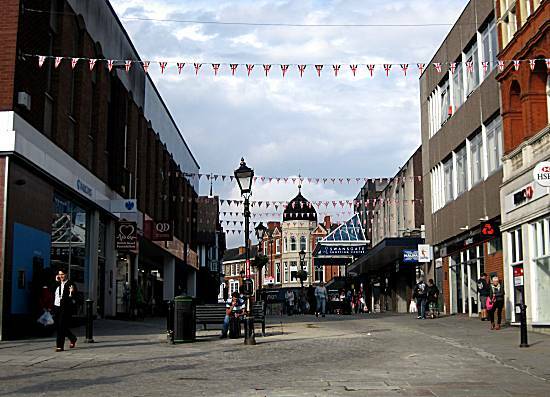 Walking into the centre of the town, the crew were humbled to find that the locals had decorated the town with bunting in recognition of their incredible performance of reaching the town in record time. Afterwards the crew sheltered from a thunderstorm in the Coach and Horses where they tested some Adnams Ghost Ship ale, whilst watching recorded highlights of this weekends Monza Grand Prix. The staff tempted them to excellent Pie and Fish & Chip dinners which were consumed, whilst listening to Jazz from a local group. The crew awoke early, but laid in for some time, knowing that that would soon have to undertake the near impossible task of turning the boat to head back towards civilisation. 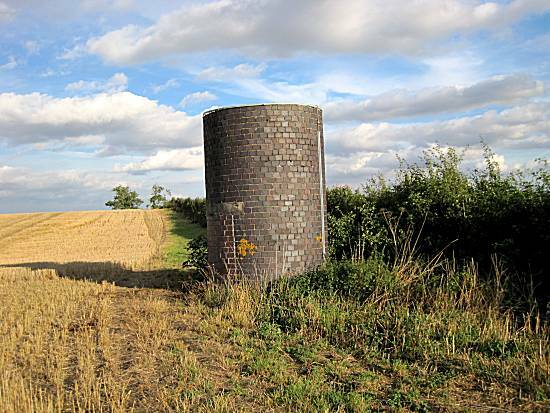 They also knew that the fresh water tanks needed filling and that they must get additional provisions from the Tesco store. They rose with in trepidation, but remained confident. Ron again prepared perfect porridge, before they carefully guided the narrowboat down to the water point where they filled the fresh water tanks to the very brim. They felt relieved that this had saved the mission from certain failure. Warnings of hidden rocks alongside the edge of the river were taken into account as the crew completed the boat turning exercise with ease. The crowd of locals stood in amazement, not realising that such a manoeuvre was possible with a 60 ft boat. The crew also made a successful expedition to Tescos, where they purchased a seeded batch granary loaf, finger rolls and cup-a-soups. The important tasks of the day, mentioned above, delayed the start of their journey and fearing a disaster they set off at high speed operating the complex Guillotine Locks at an incredible pace. The locals were impressed, but suspected foul play!! At White Mills Lock the narrowboat was boarded by inspectors, who having been informed of the incredible speeds being achieved by the skilled crew, had been instructed to check out the boat for illegal devices!! 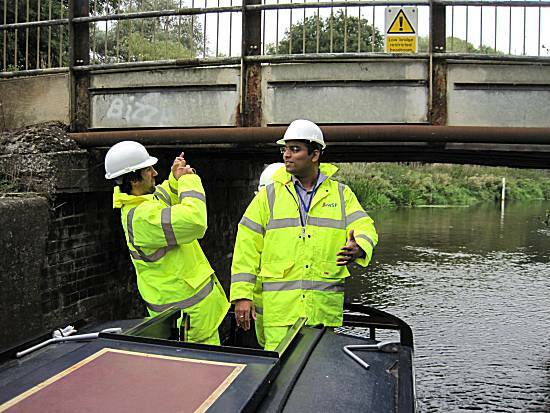 After exhaustive searches of the narrowboat and having taken much photographic evidence, the inspectors came to the conclusion that the incredible speeds being achieved by the boat were accomplished merely by the immense skills of the crew. The now friendly inspectors posed for photographs before reporting back to the authorities. After the traumas of the official inspection the crew relaxed, as the river became wide. Back on schedule, the crew kept speeds to reasonable levels, so as to not cause further concern to the locals. 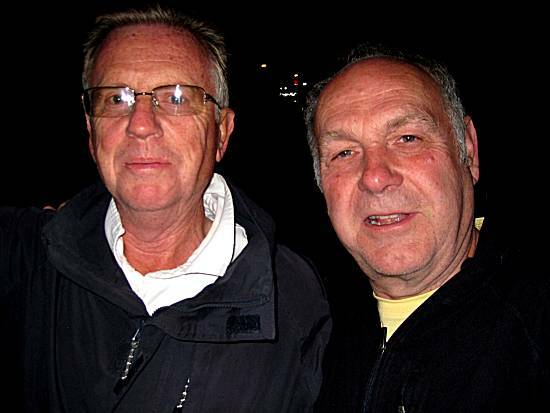 As the weather forecast suggested that more rain was due, the cunning crew contacted "The Britannia" who gave special permission to moor alongside their restaurant, so long as the crew provide autographs and photo opportunities for the crowds of well-wishers. Having moored at the incredible hour of 4pm, the crew relaxed before a further night of celebrations. After showers, the crew ventured some 5 yards to the entrance of the pub and relaxed further in the warm cosy conditions, with pints of Spitfire ale from the Shepherd Neame brewery. Steak dinners were enjoyed by the crew, before at the request of Ron, they returned to the boat to attempt to watch the end of the England/Ukraine match. Being unable to get any sort of picture, Ron settled for listening to the final minutes of the match on Radio 5 live, before they retired to their bunks. The crew were awoken sharply at 6:30 with a blast of sound from the public address system at the pub outside and they afterwards lay puzzled and confused. 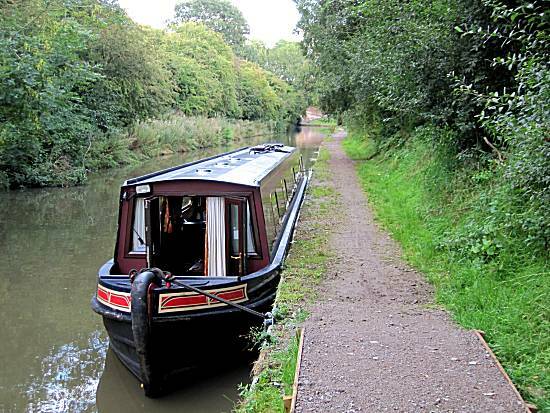 Soon their minds focused to their planned destination for the day at Bugbrooke, conscious that the dreaded Northampton Arm of the Grand Union Canal lay ahead of them. 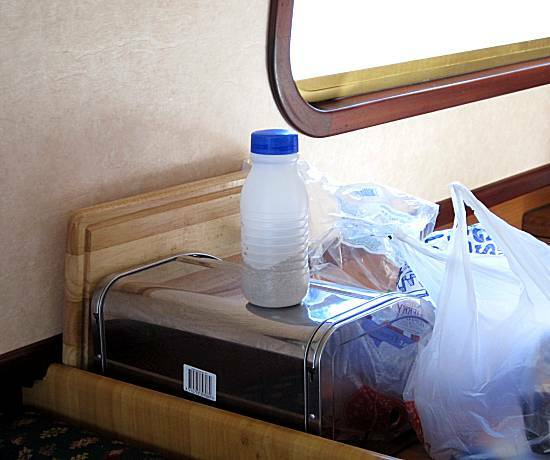 Ron's porridge was consumed in small mouthfuls by the concerned crew, before they set off into Northampton down the final section of the River Nene. The crew took a break in Northampton and spent a pleasant hour viewing the historic buildings and market place, greatly improving their knowledge of the area. 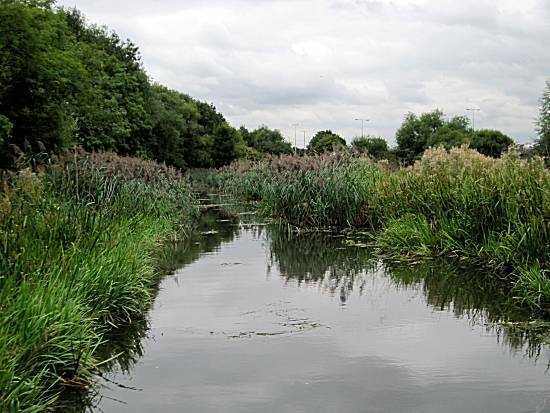 Afterwards they set off in trepidation taking the difficult turn off the river, returning the Grand Union Canal. 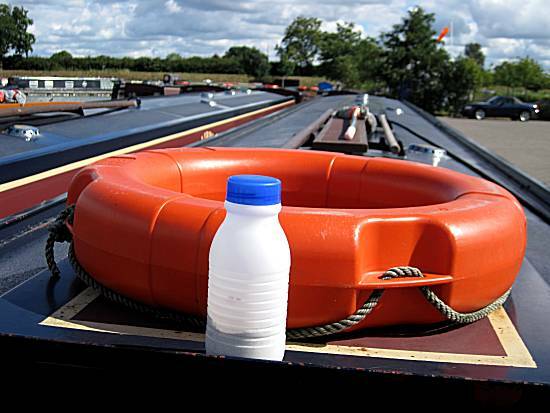 Neil was quick to add his support for the troubled crew at this difficult time and spent some time on the roof of the narrowboat. 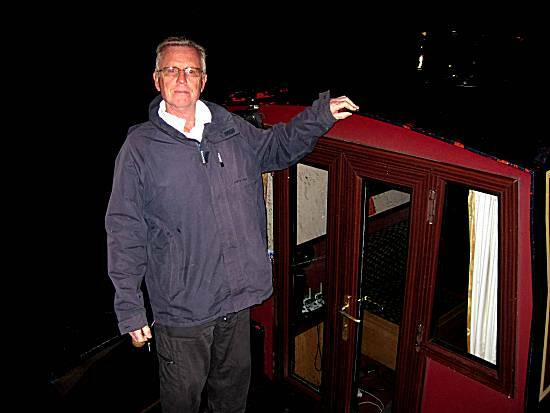 While Neil was on the roof he slipped and fell into the canal, much to the alarm of the other crew members. 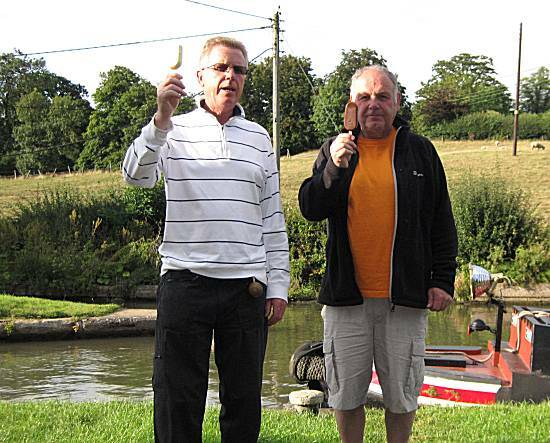 Ron put the narrowboat into an emergency stopping procedure and Alan desperately tried to reach Neil with the boat hook. Using considerable skill the crew were able to drag Neil to safety and he was taken back inside to dry himself and warm up. The crew were relieved that he was back on board. The crew set about negotiating the flight of 17 locks on this section of canal, again travelling beneath the M1 motorway. 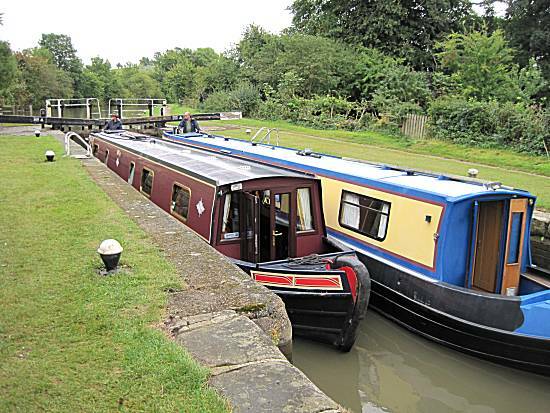 They found themselves following another narrowboat, who they could see were struggling under the impossible conditions. 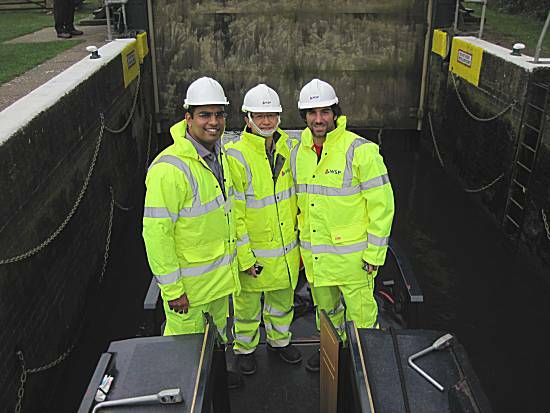 With characteristic compassion the crew assisted the passage of their boat up the flight of locks, even though the grateful occupants had invited the crew to pass them and leave them to their fate. The conditions on the canal continued to deteriorate, but the crew pressed on regardless. 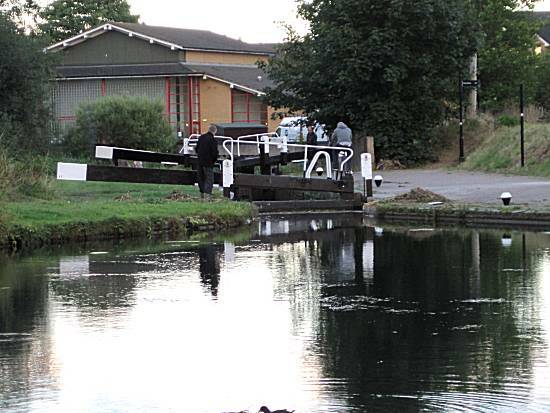 Eventually the crew saw Gayton Junction appear in the distance, signalling to the crew that the relative safety of the main Grand Union Canal had been reached. 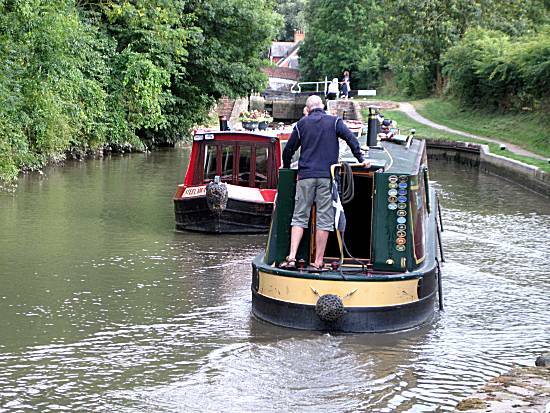 Despite a narrowboat being moored in an inconsiderate position on the junction, Ron made the turn with one clever reversing excercise. Realising that the crew had completed the Northampton flight without the benefit of any lunch, Ron quickly prepared special extra thick smoked mackerel fillet sandwiches with cup-a-soups, which were greatly appreciated. In the continuing rain, the narrowboat was accurately guided towards it's destination for the evening at "The Wharfe" in Bugbrooke. Again the crew were humbled to see that the locals had kept a perfect mooring position free for their craft, directly outside the pub. The crew arrived in a cold and exhausted state after yet another hard day, but quickly readied themselves for a night of festivities. The cunning crew selected Gammon and Egg dinners in the select restaurant area, which were served with "Squiggles" on the plate and accompanied by Hobgoblin ale. The crew were most satisfied with their selections. Afterwards they returned to the boat to enjoy coffee before retiring to bed in the almost certain belief that success of their mission was guaranteed. The crew drifted into consciousness in a relaxed state and immediately set about preparing themselves a nourishing porridge breakfast. Setting off they knew that they had a 2½ hour relaxing cruise without locks before reaching the mighty flight of Buckby Locks. They remained calm at all times. After checking the bread stocks they awarded themselves toast, without marmalade, which greatly added to their wellbeing. 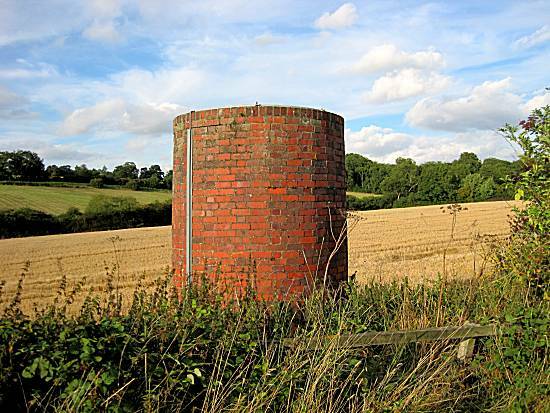 They took the opportunity to fill their fresh water tanks as they passed Stowe Hill Bridge and further increased their roman knowledge as they passed the various Watling Street bridges. Surely nothing could stop their success now!! Passing Whilton Marina indicated to the crew that the first of the mighty Buckby Locks would come into view. The compassionate crew buddied up and assisted a sole narrowboater through all the locks much to his eternal gratitude. Feeling exhausted they stopped just after Norton Junction to enjoy a special ham salad with the remaining cup-a-soups. 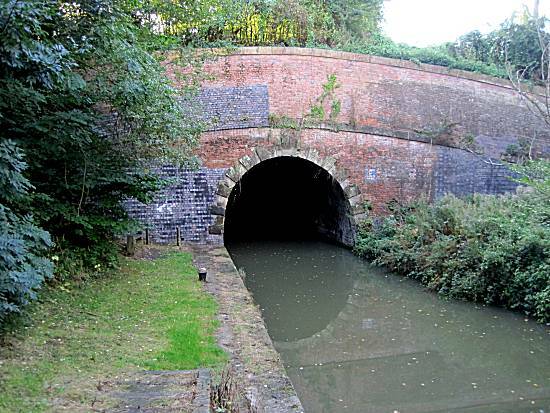 Within minutes the portal of Braunston Tunnel came into view. Knowing that they had previously traversed the tunnel in an incredible 19 mins and 8 seconds, they decided to break their previous record. 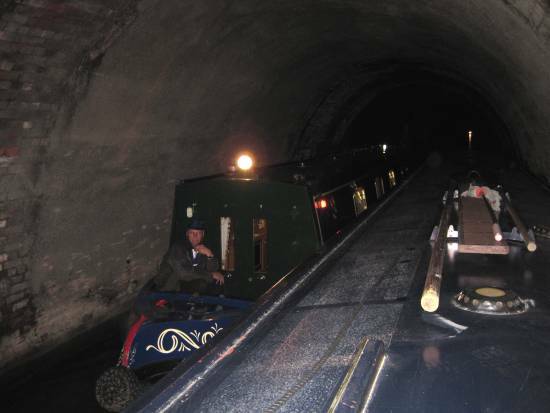 The locals had arranged for the tunnel to kept clear and Alan made adjustments to the engine and navigational system as they entered the tunnel at an unbelievable speed. 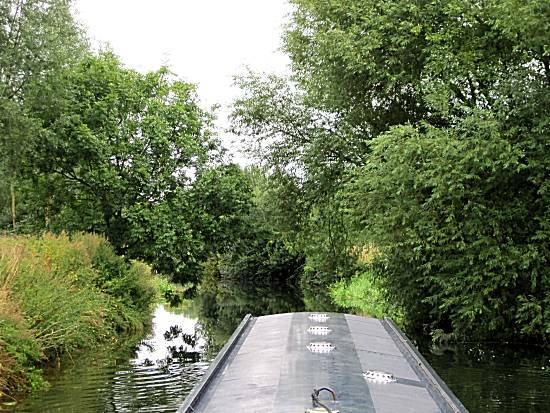 Despite the risk of suffocation due to the blistering speed, the narrowboat was seen exiting the west portal in 17 mins and 29 seconds. 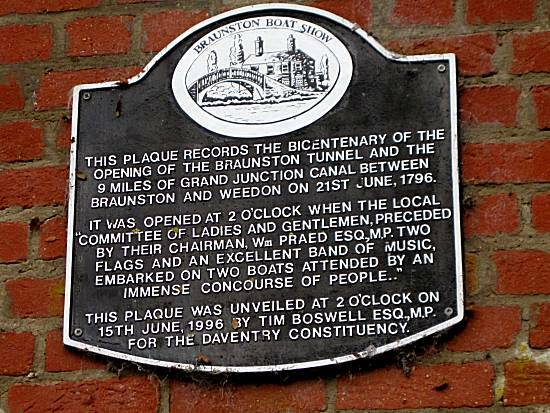 Much rejoicing was seen in Braunston that evening. The crew wishing to avoid publicity of their record breaking tunnel success, moored short of Lock No 6 and hid in the Admiral Nelson, testing cornish ales and pretending to be locals. Their actions were successful and after briefly visiting the town they headed back towards their narrowboat. 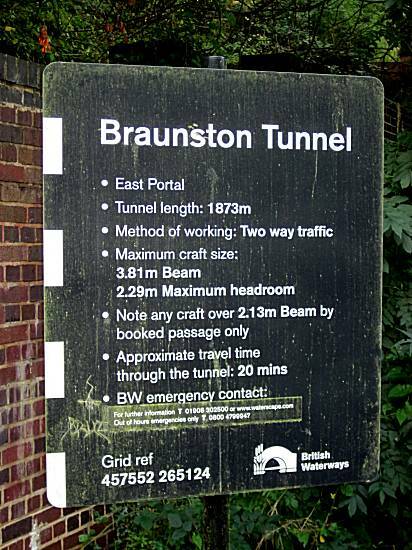 Alan was discontent with merely breaking the Braunston Tunnel record and felt a desire to discover the hidden East Portal and other secrets of the tunnel on foot. The locals strongly advised him to not attempt such a dangerous expedition, but he ignored their protestations. 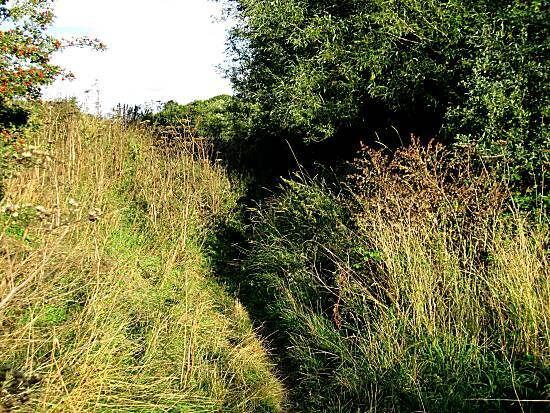 Alan retraced the difficult 1½ mile route back to the boat, where after showers, they set off to the Admiral Nelson for beefburger dinners with Everards and Cornish ales. 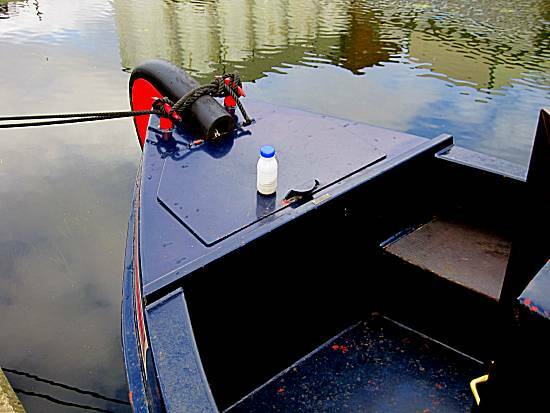 Afterwards they returned to the narrowboat to contemplate the many successes of the day. They retired to their bunks knowing that they had awarded themselves a lie-in in the morning. They greatly enjoyed their lay-in until 8:30, when despite their fears regarding Friday 13th, they rose and Ron prepared penultimate porridge. 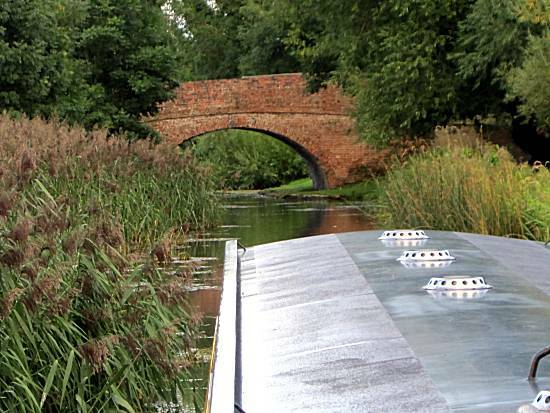 The crew prepared the narrowboat for extreme locking and they set off towards the Braunston flight of locks at high speed. In order to save water the crew "Buddied" with another narrowboat, who's crew benefited from the rapid passage through the locks. 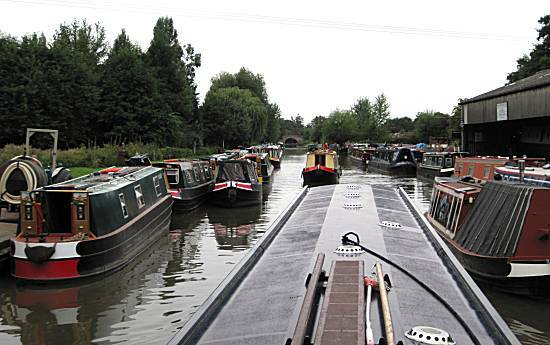 The crew witnessed massive numbers of narrowboats as they travelled down the flight, which were rumoured to have gathered to view the passage of the famous crew through Braunston. The crew graciously acknowledged the crowds. 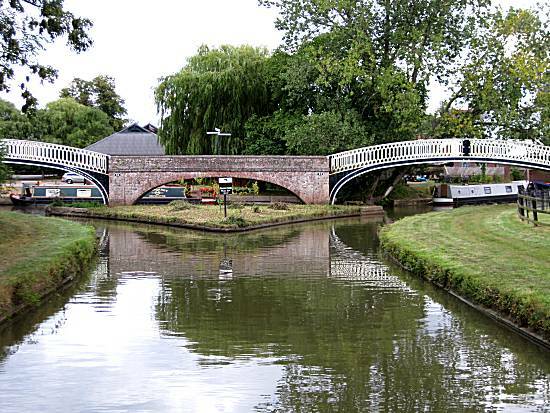 Having successfully completed the Braunston flight of locks the crew moored to toast the last of their bread and awarded themselves a boiled egg each. 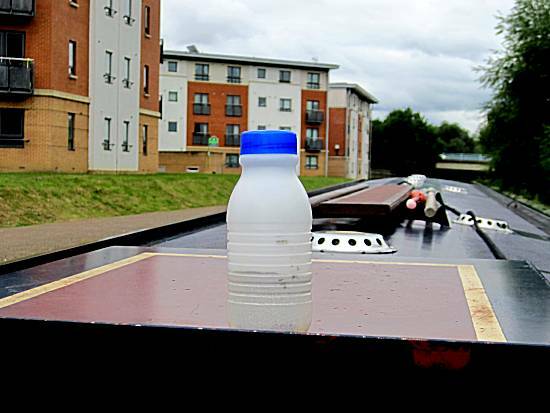 Supplies on board were now running dangerously low and the crew were aware that this could jeopardise the mission, but the crew put this to the back of their minds knowing that that they would soon have to turn into the Oxford canal !!! 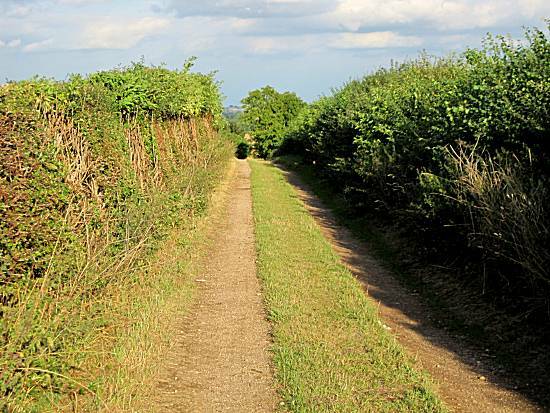 The narrow Oxford Canal was littered with moored boats effectively blocking the crew's navigation and in addition a procession of boats were travelling in the opposite direction, allegedly trying to get to Braunston. Although this slowed their progress, they were unconcerned, knowing how far ahead of schedule they were. 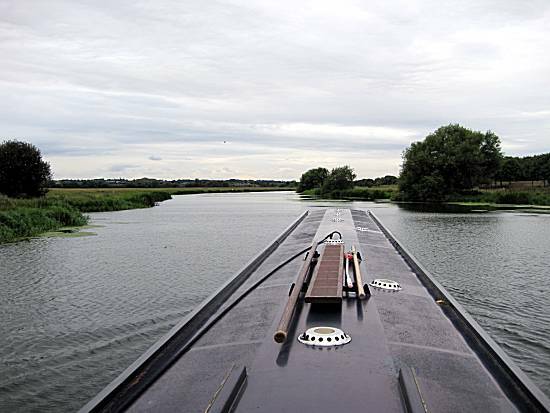 The crew passed Wigrams Turn Marina (the end of their journey) and proceeded to a 70ft winding hole close to the start of the Napton flight of locks. Here Alan completed a textbook turning of the boat before mooring in an ideal location. Quickly they prepared an excellent Smoked Mackerel salad, without cup-a-soups or bread. Rain soon set in and the crew spent their remaining time usefully studying their charts and furthering their education, whilst they wait to visit the nearby Folly Inn for their tea. The crew take Neil (In his milk bottle) to the Folly Inn for Chilly and Ham & Egg dinners to celebrate their successful mission. Just a 30 minute trip back to the boatyard remains in the morning. 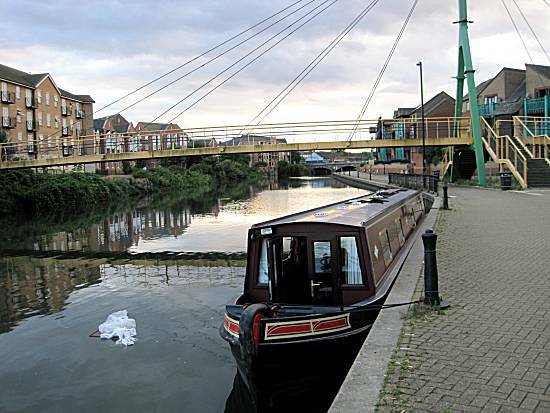 The crew were pleased with their performance, but secretly spend their time discussing a hidden waterway linking the River Lee to the tidal Thames. Just maybe one day they will plan a future expedition to explore this area.